A leather football with one white and three brown panels. 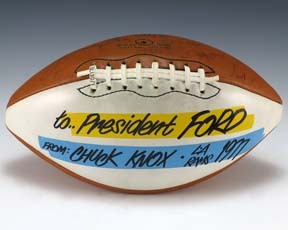 On the white panel in black , yellow and blue reads "to..President Ford / From Chuck Knox LA Rams 1977." The players of the 1977 team have signed the brown panels in ink pen. Popular autographs include Hall of Famers Tom Mack and Joe Namath; and players Pat Haden and Vince Ferragamo. The Ford's retired to Rancho Mirage, California in 1977 where Ford served on the Rams advisory board.